Brain tumors located at the base of the skull are some of the most challenging to treat, because of their proximity to the brain stem, as well as important nerves and blood vessels in the head and neck (Johns Hopkins). The brain stem maintains breathing and heartbeat, the basics of life. Tumors found here are known as “skull base tumors” based on their location, not the type of tumor. A group of doctors at Toho University Omori Medical Center in Tokyo, Japan, hope to improve surgical models for skull base tumors. 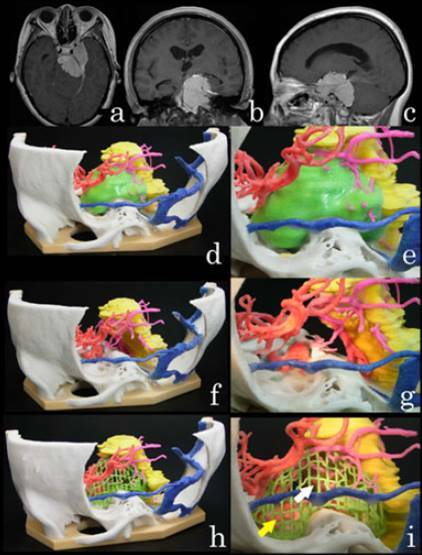 3D printed models are often made from opaque materials such as plaster, which make it difficult to visualize the essential brain structures. The doctors’ idea was to develop a surgical model where the tumor was made from a mesh structure. First they had to design the mesh. They made a series of objects with different spacing between the mesh and different mesh thickness. They made 20 trials of each structure, a total of 400 models. Once they decided which mesh provided the most transparency and structural integrity (they chose the one in the photo below), they proceeded to test the tumor models. To make the all the models, the researchers used the Z Printer 450 from 3D systems which uses binder jetting, where layers of a plaster powder are fused with a binding agent to make the model. The models were then coated in paraffin wax to make them more durable. Once they decided on which grid to use for the tumor models, models were made from brain scans taken of four patients between 2007 and 2014. The imaging used for each patient was CT angiography (CTA) for the skull, MRI for the tumor and brainstem, and 3D digital subtraction angiography (DSA) for the blood vessels. They determined that they the mesh tumor structure enabled them to both visualize the deep brain structures, and also understand the spatial relationships between those structures and the tumor. The method was limited by the physical vulnerability of the mesh and the difficulty of judging the surface of the mesh tumor compared to the solid tumor model. The authors expected improvements in 3D printing technology to enable thinner mesh as well as translucent material. Kosuke Kono et al. published a paper describing their study online two weeks ago in Acta Neurochirurgica: The European Journal of Neurosurgery.